Painting cars and getting them into rFactor is great fun and easy to do. Here's a run through of the basics. 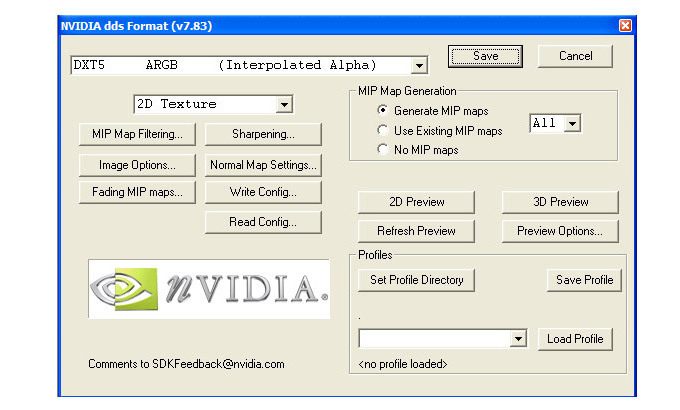 Download and install NVIDIA's Photoshop Plugins. It includes the DDS Plug-in which allows you to save .dds files out of Photoshop, the file format car skins need to be in. 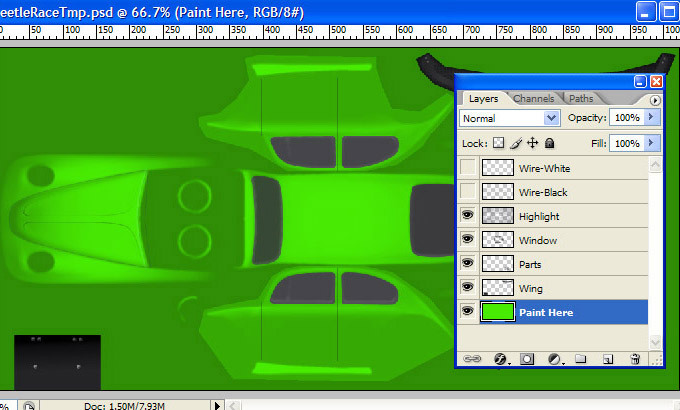 Download and open the template of the car you would like to paint in Photoshop. 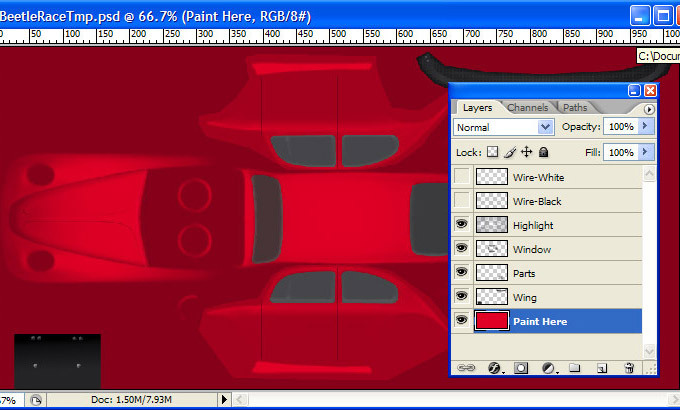 Car templates are sometimes included in the mod installation, but more often are made available as a separatel download. 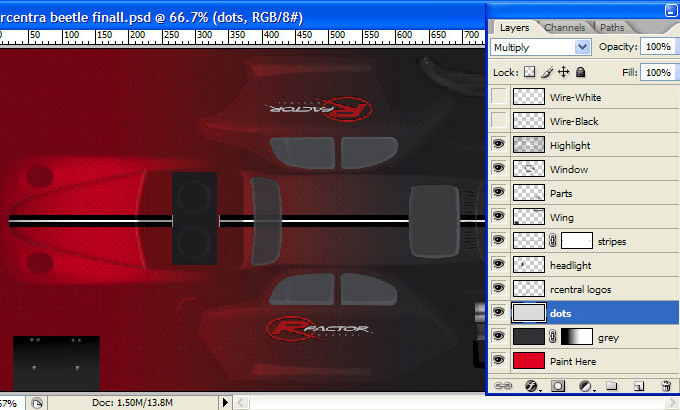 Refer to the car profile or Templates area on rFactorCentral for template downloads. Every car template you open is most likely going to be organized differently. Most however make it clear the layer on which you are meant to paint, or more exactly where in the layer stack. I'm painting a VW Beetle for this example. The person who made the Beetle Race template was kind enough to name a 'Paint Here' layer at the bottom of the layer stack - that's where all the painting action happens for the Beetle. It may be named differently in other templates. Templates usually include a wireframe layer which can be handy for positioning logos etc accurately, and on both sides of a car. The wireframe layer isn't used when you export. A shading layer is usually present somewhere towards the top of the stack too. It is used when you export your skin - the best bet for now is to not mess with it. Apart from the main car body it's not always clear how all the bits and pieces in a blank template are applied to the car in-game. To help get orientated, open a completed .dds file (e.g. one of the teams) of the car you're wanting to paint. Compare what you see in the finished .dds file to what you see in game - it's much easier to work out what each piece in the template is for. What you do now is completely up to you and your Photoshop skills. A flexible approach is to place logos etc on their own layer. 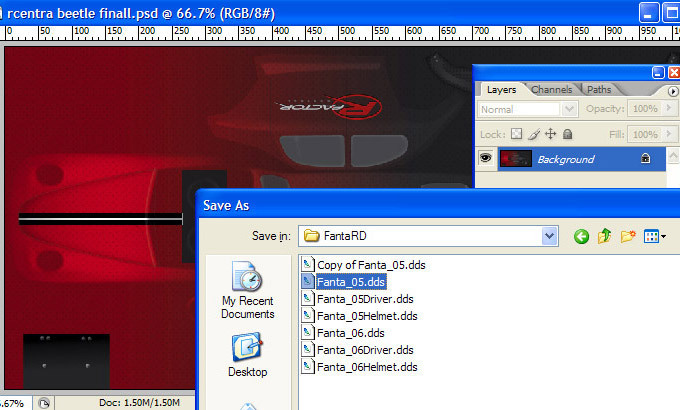 If you're insanely tidy you might even use layer folders e.g a folder for the skin on each side of the car. Whether you are painting a real world skin or creating a fantasy skin, you need stuff to put on your car, lots of stuff. A good source of hi-res logos is Brands of the World. Vector based logo files are ideal as you can rasterize them at a size to suit your needs, resulting in high quality, clean logos for your car skin. Services like Google Images are also a good place to find logos, as well as photographs of real world cars to use as a reference. If all we wanted was a green Beetle in-game we'd only need to fill the paint layer with green, flatten the file, save it as a dds and we'd be close to done. Usually though you want to do more than a straight color when painting a car. I'd like to keep red as my base color so have reverted to that. For a little interest I've added a layer filled with a small dot pattern above the red layer and changed the layer mode so it is visible on the red layer below. I'd like a color transition front to back so I've added another layer and filled it with a dark grey. I've added a layer mask to the dark grey layer and filled the mask with a white to black linear gradient, resulting in a gradual transition red to dark grey on the car. I had an rCentral logo handy so dragged it into the template and used the Transform tool to size it as needed. By duplicating the logo layer and rotating the duplicated logo 180 degrees it's ready to use on the other side of the car. The circular housing around the headlight might look good in a contrasting color to red, so I covered the housing area of the template with a dark grey that matches the back of the car. You only need to be concerned with the pieces of the car in the template your painting is covering, not the empty areas of the template. It's only a basic skin at this stage but it should be enough to start you thinking about how you'll approach painting your own cars. Don't forget to save your layered master file along the way. Chances are you'll want to return to it to make changes and/or to borrow logos etc to re-use in other skins. Before you can save your skin as a DDS the file needs to be flattened. I usually toggle off the visibility of all layers that aren't a part of the finished skin and then choose 'Flatten Image' from the Layers palette options, confirming Photoshop's 'Discard Hidden Layers' warning. You usually save as a dds to check your how your skin is progressing a few times during painting - especially if it's the first time you're painting a car - to check on how it's coming together and other details that can only be seen when the skin is on the car. One of the quickest ways to see your car in-game without messing with veh files is to back up an dds file belonging to a car in the mod and overwriting the original dds with your own. 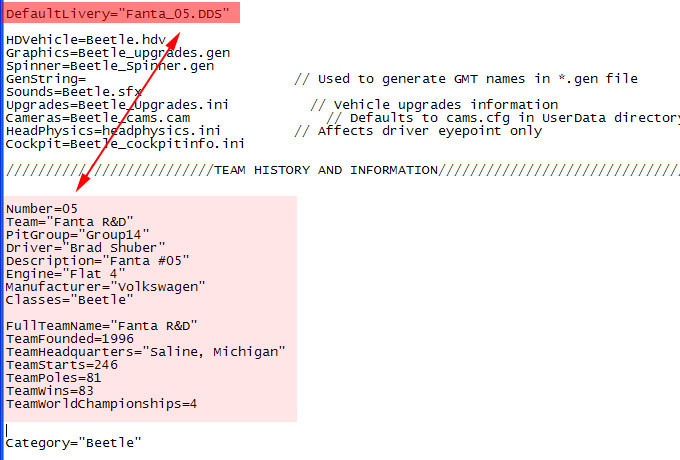 In the example below I've made a copy of the original Fanta_05.dds and am going to overwrite the original. Overwriting existing .dds is ok for messing around but it's not going to get you far when it comes to getting your skins into game properly. The good news is it's easy. The .dds file you've made. The .veh file is a simple text file that lets rFactor know how it all fits together: what dds file the car uses, team, car number and driver info, which physics and sound files etc. The .txt file is optional. It includes Painter related credits and description. These files could be loose in Vehicles\ModName but it's better to have subfolders that contain each skin/team. Change DefaultLivery="*****.dds" to the name of your .dds file. That is the most important re seeing your skin in game. Update Team and History Information. You should give new cars the next available car numbers and name the .dds, .veh and .txt files accordingly, as well as the car number. With all of that done your skin should function in-game as an additional car/team to an existing mod. Using rFactor to check skins as you are painting is uncessarily slow. Provided you have created a folder for your skin/team within the Vehicles\ModName\ and it contains your .veh and .dds files you can use David Noonan's Vehicle Viewer to check how your work is progressing. 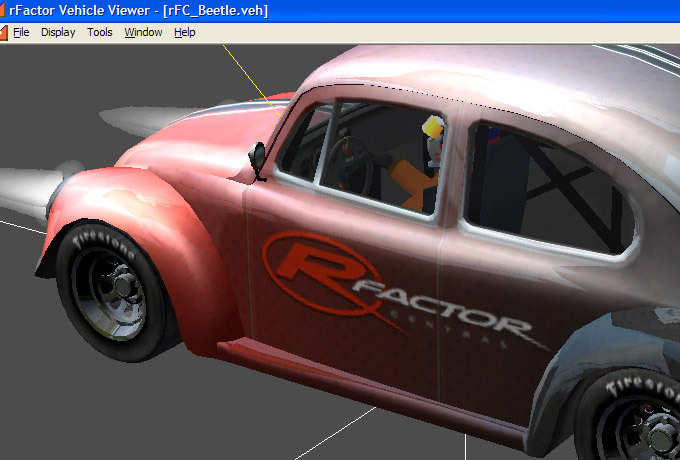 With the Vehicle Viewer open, select File > Open rFactor Vehicle and browse to your .veh file. Refer to the Vehicle Viewer Help files, along with the Support files on David's site for further information and troubleshooting regarding Vehicle Viewer. If you're new to painting in rFactor I hope you've found this post useful. 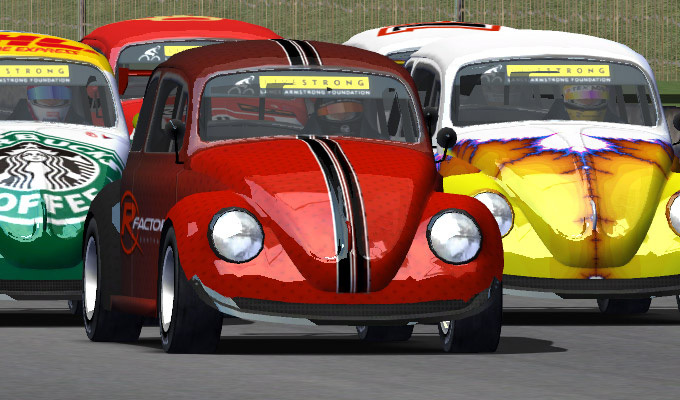 The Beetle skin is available for download in the Skins area. Painting cars for rFactor is great fun. Are you a Painter with tips and tricks to share? You are welcome to contribute to the Spray Booth. Contact Us.